Rookie Betts injures his left foot during a collision with Orioles catcher Chance Sisco. 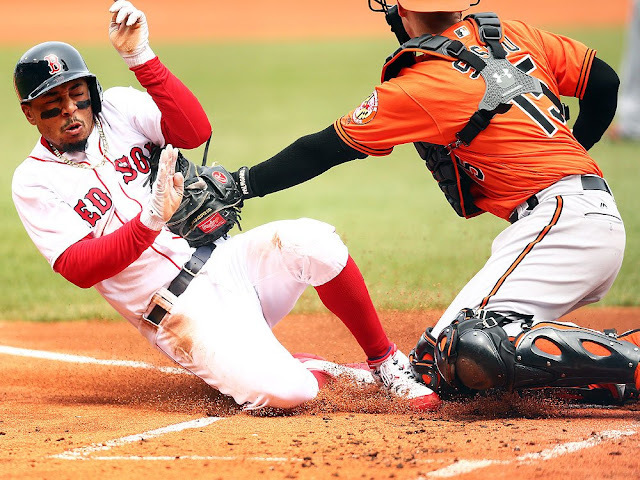 During Saturday's game against the Baltimore Orioles, star outfielder Mookie Betts was removed from the game after suffering a left foot contusion during a collision at home plate. The Red Sox have since announced that X-rays have come back negative and have ruled him day-to-day. The collision occurred in the first inning, when Betts tried to avoid a tag from Orioles catcher Chance Sisco. Betts scored on the play, but appeared to jam his left leg into Sisco's shinguard. Betts limped back into the dugout with trainers and stayed in the game for another at-bat in the second inning. Betts was then replaced by Blake Swihart before the top of the fourth. Swihart was placed in left field, which prompted Andrew Benintendi to move from left to center field and Jackie Bradley Jr. to move from center to right field. Avoiding a serious injury is great news for the red hot Red Sox. Betts was off to one of the best starts of anyone in the majors, hitting .353 with two home runs and 10 RBIs in 14 games.